Painting contest. Una and Richard take the artists to London's South Bank to attempt one of the most notoriously tricky painting challenges - portraiture. Presenters Una Stubbs and Richard Bacon take the artists to London's South Bank. In a converted Victorian warehouse by the Thames, expert judges Lachlan Goudie and Daphne Todd OBE set the nine remaining artists one of the most notoriously tricky painting challenges - portraiture. For their opening task, the judges give the artists just four hours to paint an image they see every day in the bathroom mirror - their own self-portrait. But for many, success isn't staring them in the face as they struggle with proportion and scale. In the quick-draw challenge the artists have just 30 minutes to capture the likeness of a complete stranger. 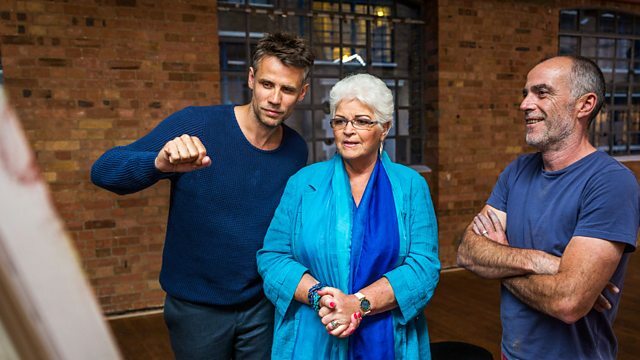 And in their last chance to impress before someone is sent home, the judges want to see how the artists cope with two very well-known faces - EastEnders stars Rudolph Walker OBE, who plays Patrick Trueman, and actress Pam St. Clement, famous for her role as the formidable Pat Butcher for more than 25 years. For some it goes wrong from the off, and they're left gambling with the decision of starting again from scratch. Also, Una chats with acclaimed royal portrait artist Nicky Phillips about what it's like to paint Her Majesty the Queen and to welcome both Prince William and Prince Harry into her home. And Lachlan gives his expert advice on how to sketch someone's likeness, where proportion and scale are everything. Mariella Frostrup and Rev Richard Coles host a new competition for amateur artists.